The durable, high quality YewdaleKestrel K511 lockable stainless steel paper towel dispenser has a stock level indicator window. Suitable for C-fold / multi-fold paper towels. Mounted to a high quality moulded polycarbonate K09CW YewdaleKestrel mounting plate (included). The hygiene-friendly polished satin steel surface of this K511 paper towel dispenser is easy to clean. 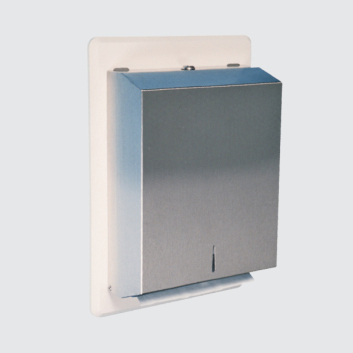 The built-in lock prevents unauthorised access to the storage compartment, whilst its mounting to a 100% fail-safe K09CW backing plate means that it will come away from the wall when subjected to an unusual loading. Suitable for both C-fold and multi-fold paper towels. The magnetic anti-ligature YewdaleKestrel® K511 paper towel dispenser as manufactured by Yewdale, +44 (0)1268 570900. Satin stainless steel dispenser for C-fold / multi-fold towels with lock, mounted to YewdaleKestrel® moulded backing plate, complete with magnetic brackets to allow plate to part from brackets under excessive load.